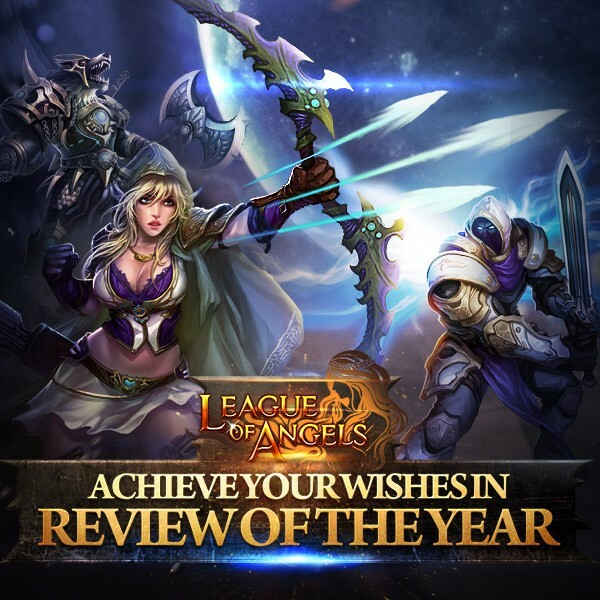 Description: At the end of the year, we thank all the players all over the world for your devotion and suggestions. We are glad to share the encouraging information with all of you in Yearly Review, and have prepared some wonderful events. Hope you keep enjoying our game! There are six pages in Yearly Review panel, namely Information, Angels, Mounts, Heroes, Character and Challenge. In each page, we share exciting information about the game with you, and you will find Discount part and Collect part in later four pages. In Discount part, you can buy some relevant items in each page, and the discount rules are same. 1.All items in the Review Sale can only be selected once in each purchase. 2.System calculates the total price of the selected items. Discount will be applied to the purchase once the price exceeds a certain amount. In this page you will see some interesting information about angels, such as which Angel is the most popular? Which Angel offered the greatest support in your growth? And the little-known gossip about Raphael. Besides you can take part in the Discount and Collect part to get the items you need by purchasing or achieving certain goals. In Discount part, we prepare various popular Angel Icons. In the Collect part, you can collect rewards by achieving certain goals. In this page, you will see the most popular mounts among players, and you will have great chance of summoning the mount you always wanted. In Discount part, we prepare many Mount Souls, you can get them in a discounted price once the total price exceeds certain amount. Who dares to look down upon Berserker Claw? It can be tamed, trained and evolved to Godless Wolf! In the world of war, what matters is no the shape but the real power? Come to check out who is more powerful in Tavern and compete for the Title of Grand Tavern Lord! In Discount part, we prepare many Hero Crests and Icons, you can get them in a discounted price once the total price exceeds certain amount. Have you joined the 650K Battle Rating Club? According to the research, there are 1,598 players in this Club! Hurry up, raise your BR and become stronger! In Discount part, we prepare many Fairies Rocks, high level Gems, Runestone, Synth Scroll, and Fashion Cores. You can get them in a discounted price once the total price exceeds certain amount. Have you end your Daily Zodiac Challenge with Pisces? Everyday more than 86620 players fight monsters and system problems! Fight for justice and get more resource for your journey! In Discount part, we prepare many Flaming Stones, Aegis Shards and Awakening Stones. You can get them in a discounted price once the total price exceeds certain amount.